The Malay Peninsula was, and still is, a global centre of trade. Trade brought people from all over the world. They traded, made friends, and even married and settled down, producing new hybrid cultures unique to Malaya’s soil. The long Portuguese involvement in Southeast Asia—from 1511 until 1975—is perhaps best-known today for producing the only Lusophone state in the region, Timor-Leste. However, it was their conquest of Malacca that first gave them a foothold in Southeast Asia. Today, the Straits of Malacca is dominated by Islam, Hinduism, and Buddhism, and the English and Malay languages. But a small yet hardy Portuguese Settlement continues to survive, deeply Catholic and speaking their own unique variety of Portuguese: Papia Kristang, or Kristang for short. This article explains the unique history of Kristang, its cultural context within Malaysia, and breaks down how the language works. Straddling the Indian and Pacific Oceans, the Straits of Malacca is a choke point for all ships travelling between South and East Asia. Owing to this strategic location, the city of Malacca emerged as an important port, facilitating trade and attracting sailors from China, India, Arabia, across Southeast Asia, and further afield. The 15th Century saw the height of local power, with the Sultanate of Malacca taking advantage of its strategic location to become a wealthy and powerful kingdom. By the 16th century Portugal had begun exploration that would lead to the wider Portuguese Empire. After having sailed around Africa in 1497 and captured Goa in 1510, the Portuguese arrived in Malacca in April 1511. Malacca was the largest spice market in the world. Trade was dominated by the Gujurati, alongside Chinese, Turks, Persians, Armenians, Tamils, Abyssinians, and traders from throughout the Malay Archipelago. Tempted by the wealth and potential of trade around Asia, and desiring to impede Muslim and Venetian influence in the spice trade, the Portuguese conqueror Afonso de Albuquerque invaded. By July 1511, he had seized control, ending the Sultanate. The Malacca that the Portuguese conquered was already a cosmopolitan city, with established Chinese and Indian communities in addition to the local Malays. Malay was the common language spoken at the time, but in a pidginised variety, called Bazaar Malay. This variety picked up influences from other Asian languages, especially Chinese. The most famous hybrid community created in Malacca is the Peranakans, created from the marriages of Chinese and Malays, but they are by no means unique. Many Portuguese men also stayed and married local women, creating a mixed society. The children of these mixed marriages and their descendants ended up speaking a Portuguese creole, which continues to be spoken today. The Portuguese were in Malacca long enough for a mixed community with their own creolised language to develop, but Portuguese dominance did not remain long. 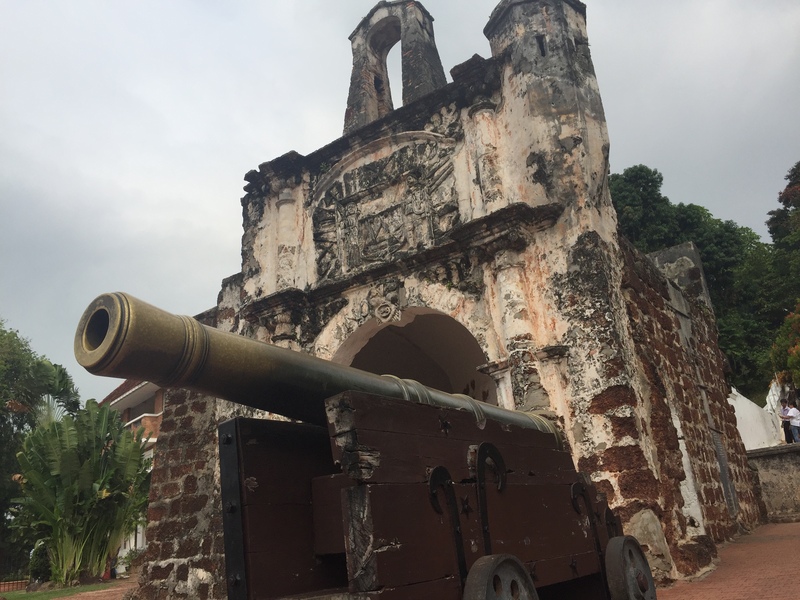 After 130 years, the Dutch took Malacca from the Portuguese in 1641. Communication between the Portuguese community in Malacca and Portugal proper was cut off, effectively isolating their language from standard European Portuguese influence. The occasional priest from Portugal would visit, but most of their communication was internal to the community. The Dutch traded Malacca to the British in the Anglo-Dutch Treaty of 1824 in exchange for Bencoolen on Sumatra. The British cemented control over what would become the Federation of Malaya by the 19th Century, relinquishing power to a local government in 1957. Throughout all this, despite (or perhaps in defiance of) the presence of other dominant and official languages, from Dutch to English and now Malay, the Malacca Portuguese maintained their own language. This language is known by various names, both inside and outside the community. As the only Portuguese-descended community of any size in all of Malaysia, it is often referred to as simply Portuguese. Others, including Professor Stefanie Pillai, Professor at the Faculty of Languages and Linguistics, University of Malaya, call it Malacca Creole Portuguese, which keeps the Portuguese identity in the name but distinguishes it from standard Portuguese as spoken in Portugal or Brazil. Others call it Kristang, which is what I will refer it to in this article. Short for Papia Kristang, or Christian speech, it is derived from the Portuguese word for Christian, cristão. 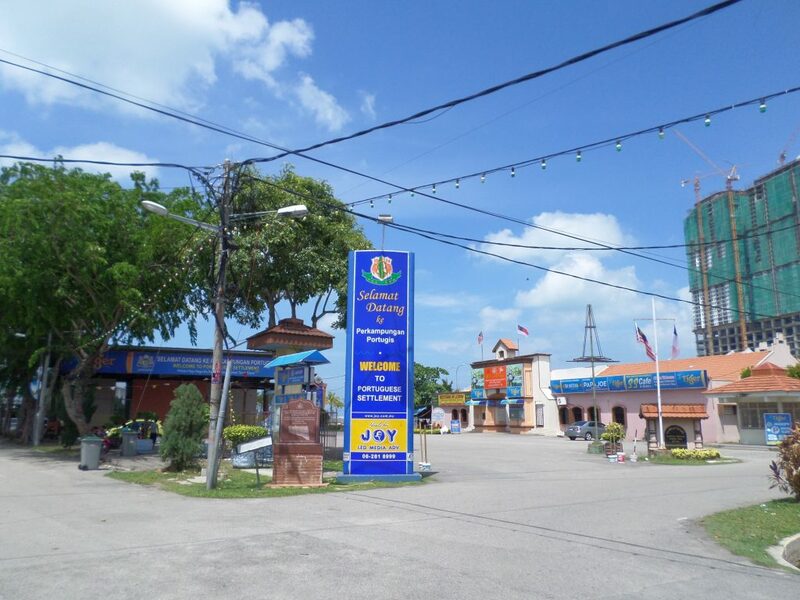 Members of the community have spread across Malaysia, and into other countries like Singapore and Australia, but the cultural centre of the Kristang community is still Malacca. People of Portuguese descent can be found anywhere in the city, but they are mostly found in the Portuguese Settlement. Despite the fact that Kristang people have been living in Malacca for over 500 years, the Settlement was only founded in 1933. As the Kristang are a traditional fishing community, the Settlement is on the seashore, where fishermen can be seen bringing in their catch daily. The settlement itself is a distinct part of Malacca. Anyone who visits will know exactly where they are. Street names are named for Portuguese explorers (Jalan d’Albuquerque, Jalan Eredia, Jalan Texeira), and the residents’ Catholic faith is on full display. Most houses are decorated with pictures of Jesus, Mary, and saints, and shrines for Mary are not an uncommon sight within the Settlement. The Settlement has its own Catholic chapel and in 2017 a replica of the Christ the Redeemer statue in Rio de Janeiro was built in the main square. Most of their cultural events revolve around the Catholic calendar. These include the Intrudu Festival, marking the beginning of Lent, where participants throw water at each other to symbolise baptism. Another important event is the Feast of Saint Peter, where they bless the boats the fishermen use. Christmas is also a big deal in the Settlement, and the Kristang take pride in their lights and decorations that are famous in Malacca. These events are also open to the public and are ways outsiders can participate in their culture. 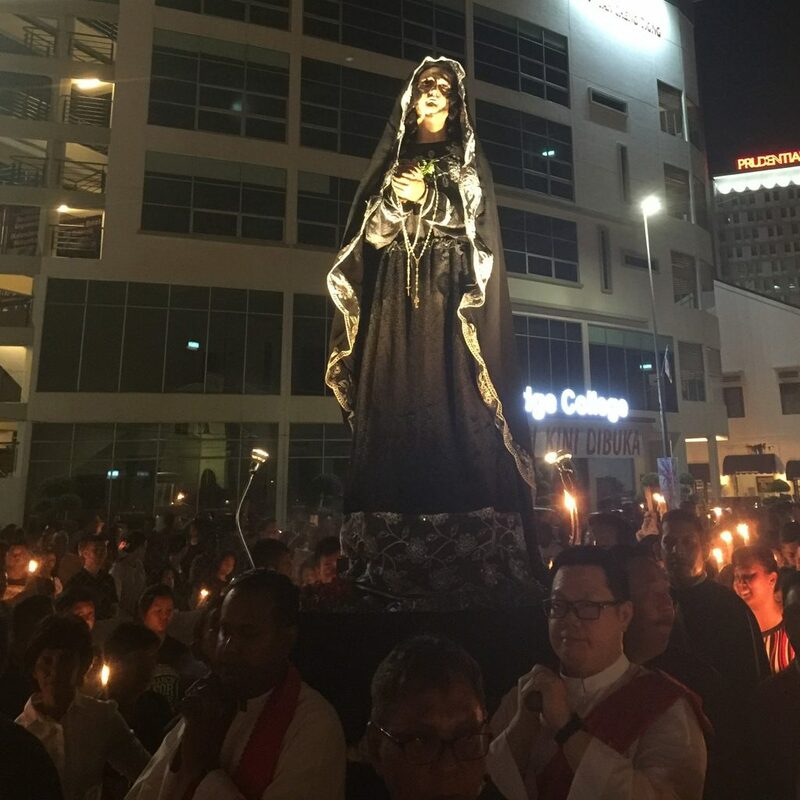 During my own visits to the Portuguese Settlement I’ve been told to come back especially for Saint Peter’s Feast and Christmas, as these are the best times to be there. The Portuguese Settlement also attracts tourists from within Malaysia and abroad. The main attraction is the main square, where there are restaurants serving local food with views of the sea. The Kristang people have never been numerous, and it’s remarkable that they’ve been able to maintain the use of their language for so long. The most recent Malaysian census reported about 1,300 people classified as “other race” living in Malacca City, most of whom are likely Portuguese-Malaysian. They are a small minority in the city of nearly half a million residents, and having their own space is an important marker of their identity. Their Catholic faith is arguably their most important marker of identity, and the most visible. It shapes their cultural and physical landscape. 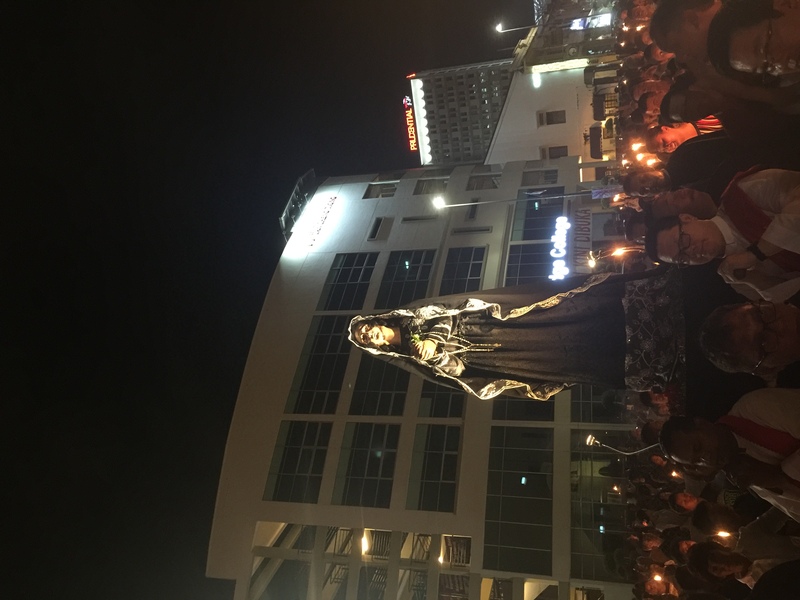 However, as there are Catholics within Malacca of other ethnic and linguistic backgrounds, it is language that is their unique identity marker within Malacca and Malaysia. Like many marginalised languages around the world, usage is fading in the face of globalisation. Among the residents in the Settlement, proficiency and regular use of Kristang is largely limited to those over the age of 40. While those younger than 40 may often be familiar with Kristang phrases, or understand the language of their ancestors, the more commonly-used language is becoming English. When a language becomes endangered, the cause is often that of a more prestigious and/or economically useful language taking its place. This process of endangerment takes place through the generations, as each new generation can speak the language with less proficiency than the one before it. Intermediate generations can often understand the language, but their actual use of it may be limited to speaking with their parents. This can be observed within the Portuguese Settlement, where you can see people speaking Kristang to each other, but English to their children. Young people generally speak English with each other, although they sometimes use some Kristang phrases. The language that they shift to is another important factor in language endangerment. The status of English as a local and global lingua franca gives speakers access to more opportunities than that of Kristang. Economic opportunities elsewhere also contribute to the endangerment of the language. While many residents of the Settlement work as fishermen or in the local restaurants, many of them find career opportunities outside of Malacca, isolating them from their community while away. Singapore is a large source of jobs, not just for Kristang speakers from Malacca, but for other Malaysians as well. While this helps the Settlement economically, it has an effect of reducing the amount of time someone can use the language while away from home. The status of English as the prestige language in Malaysia and Singapore has an effect as well, as a child who grows up speaking English can use their native language to help them advance economically and socially. This is also reinforced in the educational system of Malaysia, where Malay and English are given high importance, and Kristang is non-existent within schools. Malacca continues to reap the benefits of its location as a coastal city along one of the busiest shipping routes in the world. It is a popular tourist destination and in recent years has seen a huge amount of development. High-rise buildings can be found throughout the city to accommodate rising numbers of tourists. One major agent of change is the China-funded Melaka Gateway project. This multi-billion dollar project will create new artificial islands offshore, hosting shopping and entertainment districts for visitors to the city. There will also be a deep-sea port and a cruise terminal, taking advantage of Malacca’s strategic location. The Portuguese Settlement is no stranger to major development. Due to Malacca’s location, the state and federal governments have invested in seaside development, often without input from locals. Leaders of the community have been vocal over what the developments mean to the Settlement, but they have little influence over the actual plans. Over the years, the shoreline has gone further out to accommodate the Portuguese Square as well as a hotel, which later turned into a technical college. This college is open to all, and has offered scholarships to residents of the Portuguese Settlement. Residents lamented to me about how seaside views from their own homes have now gone. The view is also now dominated by a high-rise development built just up the coast from the Settlement. The artificial islands are changing life in the Settlement. Just beyond the seaside view one can easily see the sand being dredged up to create the islands. Not only will this development take away the seaside views, but it will also affect their traditional way of life. 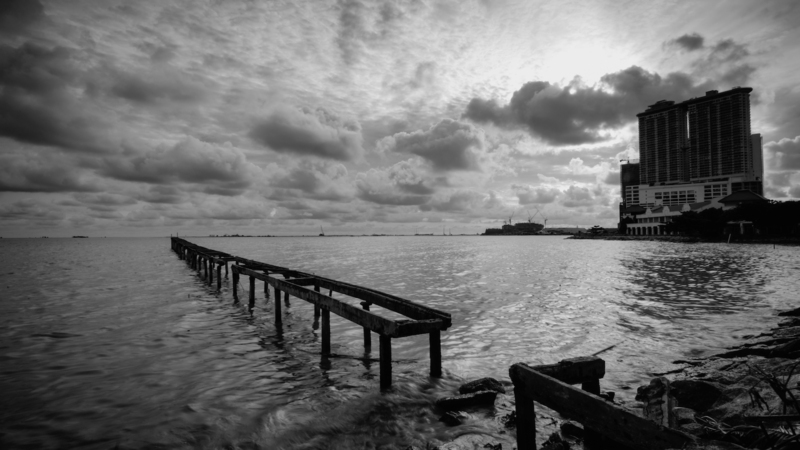 Many residents of the Portuguese Settlement rely on fishing to make a living, and they are at risk of losing their shoreline. Although some proposed plans include a canal to connect the Settlement to the sea, the construction of the islands has altered the tidal flow of the area, making it harder to fish closer to the shore. I had a conversation with an old man who told me that fishermen have to now go further and further away from shore to make a good catch. The Straits are only 50km wide at this point, so they run the risk of going into Indonesian waters, where they are not authorised to fish. This development is perhaps the biggest threat to the livelihood of the community, as the fishing is truly local, and helps support the restaurants that attract outsiders. While locals are not completely opposed to the development, as it could bring economic opportunity to the whole city, they feel that they have been ignored and not considered in the rush to develop the city. After the May 2018 elections brought in a new Malaysian government, there’s been a review of such megaprojects throughout the whole country. Last week, the Economic Affairs Ministry said that the Melaka Gateway development would be beneficial to the country’s economy. Residents of the Portuguese Settlement are optimistic about the change in government, but remain cautious in how the development will affect their neighbourhood (Mahorm and Abu Samah 2018). Because of the highly visible effects of the current situation, locals are well aware of the state of their language and the danger that modernisation can pose to it. Expressions of their culture and language are now shown within the context of sharing a culture that is at risk of disappearing, and older generations are helping the youth claim their piece of Kristang heritage, with the goal of continuing the culture. Such examples include the dance groups 1511 O Maliao Maliao, composed of adults, and the children’s group Troupa Santa Maria. These groups dress up in traditional Portuguese costume and dance to local and other Lusophone songs. The source of their dance is a mix of the traditional dance of the Malacca Portuguese, as well as new choreography. They usually perform within Malacca, but have also performed in other parts of Malaysia and Singapore to promote their culture. The community has also worked with academics to help promote their culture and the Kristang language. In 1988, Alan Baxter published a grammar of Kristang based on his fieldwork within the community. Professor Pillai has been instrumental in the documentation of Kristang, and has made sure that her research not only benefits academia and linguistics, but also today’s speakers of Kristang. Her work has resulted in the publication of a book along with Michael Singho, Beng Prende Portugues Malaká, a textbook for learning Kristang for both members of the Kristang-speaking community and outsiders who want to learn. The publication of this book was made possible by both Pillai’s linguistic expertise and the input from local members of the community. She has also made her efforts available to other linguists by submitting some of her recordings and videos to the Endangered Languages Archive at the School of African and Oriental Studies, University of London. What exactly is Kristang? How does it work? What is its relationship to Portuguese and Malay? To understand the language, we need to understand how languages work, and how creoles emerge. Kristang is considered to be a creole language, due to its origins in colonialism and the mixing of linguistically disparate communities to form a new language. As communities from diverse linguistic backgrounds interact, they need a language in common to communicate. This is often created from the languages that they know, and negotiation of meaning leads to what is called a pidgin. A pidgin is a highly specialised, reduced language used for communication between groups that do not have a language in common at the outset. Concepts and words in a pidgin are reduced to what is needed to be able to communicate, and usually not more. In the case of a pidgin in Malacca, it would have largely dealt with trade and sailing. For practical or social reasons, full acquisition of the others’ language does not occur. A pidgin is not a stable system either, meaning that grammatical or lexical rules are more likely to quickly change as they would in a full language. While not the fate of every pidgin, they can often expand their usage and become a full-fledged language, called a creole. This happens when contact between the two groups becomes more ingrained and intermarriage leads to children growing up hearing this pidgin. Such languages are spoken by entire speech communities natively, and as a full language has a stable system and can be used to express anything other languages can. The languages of input and their statuses in society have an effect on how a creole’s structure works. The language of those with power is known as the superstrate. In the age of colonialism, the superstrate language is normally that of the European power. Many creole languages have English or French as the superstrate. For the Kristang, the superstrate is Portuguese. Linguistically, this provides the vocabulary or lexicon of the language, and is therefore also known as the lexifier. Individual words in Kristang should be familiar to anyone who can speak Portuguese, as most of them are derived from Portuguese words. The language of those with less power is called the substrate. In the case of Kristang, this is Malay, the language that the locals spoke when the Portuguese arrived in the 16th century. The substrate influences the grammatical structure of the language, while the speakers use words from the superstrate. In general, the syntax of all creole languages is influenced by the syntactic structures of the substrates. When I tell people that my research involves creole languages, they often ask if I work in the Caribbean. This is not surprising, as the most famous and most spoken creole languages can be found there. These creoles came about when European colonial powers shipped enslaved Africans to their plantations and colonies in the Caribbean. Such examples include Haitian Creole, with French as the lexifier and over seven million speakers, and Jamaican Patois, with English as the lexifier and about three million speakers. Both of these languages have similar West African substrate languages. Creoles can be found in other parts of the world, mostly in places that have been touched by European colonialism. The national languages of Cape Verde and Mauritius are both considered to be creole languages. Cape Verde Creole has Portuguese as a lexifier and West African substrates. Mauritius, being located in the Indian Ocean, has French as a lexifier and African and South Asian substrates. These languages, as well as the Caribbean ones mentioned above, have the status of national language because of their histories. In the case of the Caribbean creoles, the native population had been almost totally wiped out and replaced with African slaves. Cape Verde and Mauritius were uninhabited before the Europeans took control, so as the population of the islands grew there was no other native language to compete with them. Kristang, on the other hand, was formed in an already established kingdom on the Malay Peninsula. The local population was not wiped out by disease or genocide to the extent that they were in the New World, so the languages that were spoken there remained. Additionally, Portugal was never interested in forming settler colonies, and only wanted forts in strategic areas to enrich the home nation economically through trade. These factors help explain why Kristang is endangered today, as the speaking population has never been large. Much like other creole languages, Kristang has easily identifiable super- and substrates. The superstrate is Portuguese, and the substrate is Malay. Anyone who can speak Portuguese will recognise most words in spoken, Kristang, although their pronunciation has been affected by Malay. Words include pesi, meaning “fish”, from Portuguese peixe; kaza, meaning “house”, from Portuguese casa; and kumih, meaning “eat”, from Portuguese comer. This table illustrates how Malay and Kristang use the same strategies in conveying tense and in not showing the person and number of the subject within the verb. While Portuguese uses different suffixes on the root of the verb comer to show tense, Malay uses words before the verb makan to show whether something has happened in the past or will happen in the future; the verb itself does not change. This is the same in the case of Kristang, where the verb kumih does not change, but rather particles are inserted between the subject and the verb to convey what Portuguese does through morphology (the addition of prefixes and suffixes to a word). Additionally, the Portuguese form of the verb changes according to the person and number of the subject. The final -o in Eu como indicates the subject is in first person singular, while the third person singular Ele come uses the suffix -e. In Malay, the verb makan remains unchanged if the subject changes number or person, and the same is the case with Kristang. Young members of the Kristang community in Singapore speak examples of Kristang. Although the structure is derived from Malay, the words themselves originally come from Portuguese. The Kristang equivalent of sudah is ja, which is derived from the Portuguese adverb já, meaning “already”. The Kristang particle logu is derived from Portuguese logo, meaning “later”. As the syntax of Kristang formed, these words took on meanings more similar to the Malay words than they do in Portuguese. That is, they no longer function only as adverbs but as tense and aspect markers on the verb. One example is the particle logu, often shortened to lo. Not only can it mark the future, but it can also refer to repetitive events in the past, much like English does with “would”. Although the word lo is derived from the Portuguese word for “later”, the usage of it in this context has no such meaning. It is structures like this that show how Kristang differs from Portuguese, while using vocabulary from it. Although the structure is slightly different (“we” is the object of “touch” in Portuguese, but the subject in Kristang), the meaning is the same, and it is likely that Kristang has inherited this structure from Portuguese. What is interesting is that the structure is identical to the adversative passive, down to the tokah appearing between the tense marker and the main verb. This is an example of two similar features, each from Malay and Portuguese, that have merged into a single feature in Kristang. The particular meaning of each example of this feature is dependent on context or the type of verb used in the sentence. These examples are just part of the evidence that shows how Kristang is a product of its environment. The Portuguese were in Malacca for 130 years, long enough to lead to the formation of a Portuguese-based language community, but they have been gone for 350 years, more than sufficient time for Malay influence to have a profound effect on the structure of the language. Ironically, a community and language created by the forces of globalisation and economic imperialism are today under threat from the very same forces. The impact of surrounding languages today, especially Malay and English, and the economic development of Malacca is leading to a complete cultural and economic shift, risking of disappearance of Kristang entirely. Unlike the conquests of the age of imperialism, however, today we recognise the importance of intangible heritage and the right of self-determination of peoples. 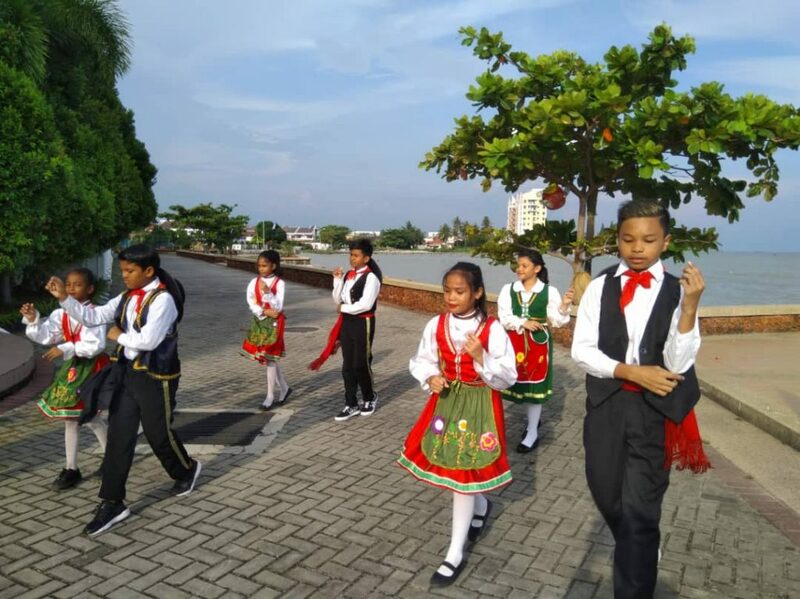 The people of the Portuguese Settlement are a living representation of the history of Malacca, and their language is a way that this history can be experienced, both by the community members themselves and by others as well. More importantly, they have a right to their way of life and to a voice in the development of their community and the Portuguese Settlement. Kristang, and the Portuguese Settlement, offers a window into one of the many diverse and unique cultures which have flowered in Malayan soil. In the midst of evolving discussions about the nature of Malaysian identity and culture amidst the backdrop of a fast-changing political landscape, it is important to remember that Malaysia is far more diverse and complex than many assume. If you’d like to learn more: This article shows just a small part of the Kristang community and their heritage. Although small, it is very much alive and can be experienced by visitors to Malacca. The best times of the year to visit are at the beginning of Lent for Intrudu, in late June for the Festa San Pedro, and December for Christmas. The visitor can experience the best and most festive of what the community has to offer, including their local food. The Kristang language can easily be accessed from anywhere. Recordings of Kristang are available at the Endangered Languages Archive at SOAS, University of London (For example, https://elar.soas.ac.uk/Collection/MPI130545). An introductory textbook from University of Malaya is also available for those who would like to learn how to speak Kristang (http://www.umpress.com.my/index.php?route=product/product&product_id=644). Local perspectives and traditions can be found in the Familia Santa Maria blog (https://santamaria-familia.blogspot.com/). Those in Singapore interested in lessons can find them at Kodrah Kristang (https://kodrah.kristang.com/). Ansaldo, Umberto (2009). Contact Languages: Ecology and Evolution in Asia, Cambridge University Press. Baxter, Alan (1988). A Grammar of Kristang (Malacca Creole Portuguese). Canberra: Australian National University. Baxter, Alan (2013). Papiá Kristang. In Susanne Maria Michaelis, Philippe Maurer, Martin Haspelmath, and Magnus Huber (eds.). The survey of pidgin and creole languages. Vol II: Portuguese-based, Spanish-based and French-based languages. 122-130. Oxford: Oxford University Press. Holm, John (1988). Pidgins and creoles, Volume 1: Theory and structure. Cambridge: Cambridge University Press. Lewis, M. Paul, Gary F. Simons, and Charles D. Fennig (eds.) (2016). Ethnoogue: Languages of the World, Nineteenth edition. Dallas, Texas: SIti. Marbeck, Joan (2004). Linggu Mai. Lisbon: Calouste Gulbenkian Foundation. Robert Laub is a PhD candidate in Linguistics at SOAS University of London. His research interests include language documentation, endangered languages, and Luso-Asian Creoles.